Official journal of Bangladesh Doctors Society. 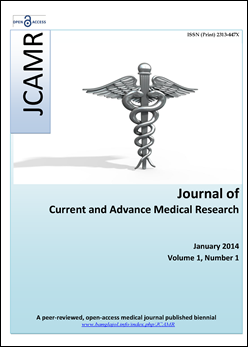 Articles in the Journal of Current and Advance Medical Research are Open Access articles published under the Creative Commons CC BY-NC License (https://creativecommons.org/licenses/by-nc-nd/4.0/). This license permits use, distribution and reproduction in any medium, provided the original work is properly cited and is not used for commercial purposes.